Serpent Lake in Crosby was bustling with ice fishers and snowmobile lovers last weekend for their annual ice fishing tournament and Scorpion homecoming event. “Two of Minnesota’s favorite things to do in the winter time, snowmobiling and ice fishing,” Jessica Vukelich, Cuyuna Lakes Chamber of Commerce Executive Director, said. Over 1,000 holes were drilled into the frozen Serpent Lake for the Cuyuna Lakes Chamber of Commerce’s 15th annual ice fishing contest. There were many ways to win at the tournament with raffle drawings and prizes being awarded for the top three fish caught in a variety of species, but the ice fishing tournament was only half the fun on Saturday. People from all over brought their vintage snowmobiles to Serpent Lake to reminisce about a brand that was essential to Crosby, Minnesota. “Collectors, former employers, racers, dealers, and distributors of hometown Scorpion Snowmobiles come back to show their machines, swap stories, and talk about the good ol’ days when Scorpion Snowmobiles was the largest employer in Central Minnesota,” Randy Harrison, the event’s Co-Coordinator, said. In 1959, Crosby, Minnesota was the birthplace of Scorpion Snowmobiles. Known for its unique rubber track and light fiber glass body, Scorpion helped transform snowmobiles from an industrial vehicle to vehicle used for recreation. “Scorpion Snowmobiles was a big part of the evolution and the history of the economy for this area,” Harrison said. 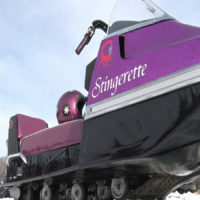 At the homecoming event, Scorpion’s Stingerette, a snowmobile for women, was the featured sled. Scorpion was eventually bought out by Arctic Cat, and when Arctic Cat had financial troubles in the early ’80s, they stopped their production of Scorpion Sleds.